Even seemingly ordinary objects can sometimes hold incredible power in Stephen King's world. If you had access to a magic box which would rid you of addiction, keep you safe and guarantee your good fortune, but in turn, you could wipe a country off the face of the Earth, would you bring yourself to do it? Would You Sacrifice the Population of a Country on Another Continent Just For the Sake of Your Own Benefit? Would you be able to enjoy your life knowing that you carry someone else’s destruction on your shoulders? Gwendy’s Button Box, the full-length novella which was born out of Stephen King’s co-writing with Richard Chizmar, takes place (where else?) in Castle Rock, Maine. The book unfolds as a classic Stephen King dilemma, introducing the ever-present and familiar Man in Black, whom we have encountered before as Randall Flagg in King’s saga The Stand or as Walter o’Dim in The Dark Tower series. We have seen this kind of dilemma in King’s Needful Things where the owner of a store with the same name, Leland Gaunt, manages to turn the otherwise peaceful town of Castle Rock into a hotbed of conflict and crime. 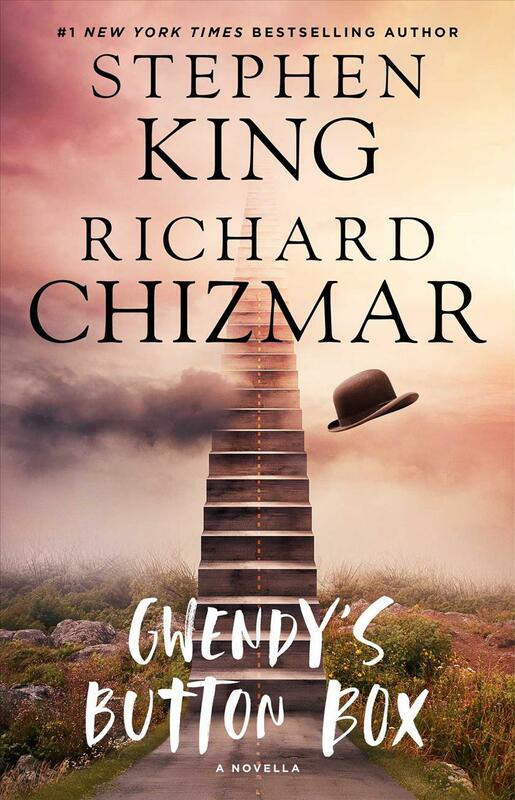 The Man in Black in Gwendy’s Button Box calls twelve-year-old Gwendy to “palaver” close to the local so-called Suicide Stairs. Averted of stranger danger, she is initially reluctant to approach him. However, what he has to offer quickly deafens her self-preservation instincts. The button box that The Man in Black wants to give Gwendy is not a regular button box, in spite of it looking like one. On the bottom of the mahogany box, there is a small drawer-like compartment that gives out little ‘gifts’ when one of the two levers of the box is pulled. Aside from the two levers, the top of the box has 8 buttons, not at all innocuous, 6 of which are said to represent North America, South America, Europe, Asia, Africa, and Australia. The remaining 2 buttons, one red and one black, are, as Gwendy is told, dangerous and could trigger mass destruction when pushed. The gifts usually come in the form of tiny chocolate bits, shaped like animals, but never in the same shape. These little chocolates are so sweet and savory that they keep any craving at bay. As many of addicts would be able to admit, this is no small issue either. Being able to resist temptation in any kind of addictive behavior is very empowering and consequently changes Gwendy’s whole life. The bottom drawer-shaped compartment also gives out silver dollars, which she could use, but her interest in those coins is minimal in comparison to what the addictive-ridding chocolates have to offer. Free of her food addiction, Gwendy’s life takes a turn for the very best She sheds unwanted pounds and exercise seems to be effortless for her. Gwendy changes from the shy, over-weight girl that no one except her best friend noticed. She becomes popular and starts living a life she could have never imagined before. Gwendy’s button box seems to change everything for the better. Her family’s relationships, once tense, become harmonious, her eating habits are healthier, exercise is part of her daily life, and even Gwendy’s school results get better. This comes at a price, though. Her best friend, Olive, feeling left out, grows more and more distant with time and ends up committing suicide, leaving Gwendy feeling guilty and remorseful, wondering what she could have done to save him. Being popular also has another downside, which is attracting the unwanted attention of a local bully, who seems to take on a personal vendetta against Gwendy because she chooses to ignore his advances. While Gwendy is not exactly sure what the red and black buttons do, she has a vague idea that, should the buttons ever be pushed, the effects would be devastating in some distant corner of the world. As curiosity begets action and power over other peoples’ lives is a very tempting matter, Gwendy does push the red color button once. Upon turning on the TV set later on, she finds out from the news that in the distant country of Guyana a cult leader named Jim Jones has convinced a large number of people into first murdering their children before committing mass suicide. Gwendy tries to convince herself that the event, in spite of being chronologically related to the moment she pushed the button, is actually unrelated. However, doubt and guilt quickly start gnawing at her. Being now aware of the power that the button box can hold over the world, Gwendy begins to resent owning it, feeling burdened by the responsibility that safeguarding the button box holds. As years go by, Gwendy does her best to hide the button box both from her parents and from other people and ultimately decides to hide it in the back of her room’s closet. Gwendy’s button box sits there for a long time until it is uncovered by the ill-meaning local bully and used to cause havoc both in a distant part of the world and in the location it is found, to kill Gwendy’s then-boyfriend, a sort of retribution for Gwendy’s possession of the box. The final part of the story acquaints us with a much more seasoned Gwendy, one who has had the opportunity to harness the powers both magical and destructive of the button box and has relinquished it in order to be able to stay away from its dark grip. Her addiction overthrown, she secretly wishes she could get rid of the box but fears for the way its power could be used, were the box to fall into the wrong hands. When the Man in Black comes back into Gwendy’s life to reclaim the much troublesome button box, Gwendy is very relieved to have it taken off her hands and with it, the responsibility to keep the world safe. This brings us, though, to a much broader subject, as people who hold the power throughout the world actually hold in their possession symbolic versions of the button box, which could wipe out the entire world in a blink of an eye. We have all seen the disastrous results that have swept the world when power belonged to the wrong people. Are any of us sure that, given the opportunity to use power either way we want, we would always use it for the greater good? Would We be Able to Keep the World Safe if it Was in Our Power to Do So? Are you a fellow Stephen King fan? Check out our other stories related to the great author right here. Writing is my newly discovered passion. I am passionate about psychology, and non-fiction while being a literature and cinema aficionada with a sweet spot for Stephen King. I am fascinated about the intricacies of the human mind and cannot get enough of studying it.